By Dennis W. Viau; modified from a classic béarnaise sauce. Béarnaise is made with vinegar—not one of my favorite ingredients. It’s okay on salad, but the acidic tartness doesn’t appeal to me. I wanted to make a sauce for sautéed broccoli, but avoid the vinegar. I substituted with fresh squeezed lemon juice. It’s similar to a classic Hollandaise, but it uses all the other béarnaise ingredients. Combine the lemon juice, white wine (or vermouth), minced shallots, 2 tablespoons of chopped tarragon (you can include the stems, as they will be strained out later), salt, and pepper in a small saucepan over medium heat. Bring to a boil and simmer until the liquid is nearly evaporated. Strain into a bowl and whisk in the cold butter. If the butter does not melt completely, warm slightly over a flame and continue stirring. In a separate bowl whisk the egg yolks until they begin to thicken a little. Slowly stream yolks into the strained liquid, whisking constantly until blended. Heat water to boiling in a larger saucepan. Reduce to simmer. Hold the smaller saucepan over the boiling liquid as you stir the egg yolk mixture with a spoon or spatula. Watch closely. Stir until the yolk mixture starts to thicken, but do not overcook. Overcooking might result in scrambled eggs, which would need to be discarded. Only thicken the mixture and then remove from the heat. With the egg yolks still warm, drizzle the melted butter, a little at a time, into the yolk mixture, whisking vigorously to thoroughly incorporate the butter each time before adding more. Continue until all the melted butter is incorporated. Taste and adjust for salt. Cover and set aside. Heat the clarified butter and olive oil in a large skillet over medium-heat. 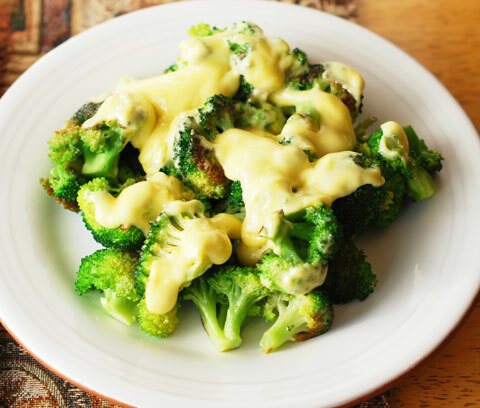 When hot, add the broccoli florettes. Stir and turn with a spatula until cooked crisp-tender, 4 to 5 minutes. Plate and spoon the mock béarnaise sauce over the top. Serve immediately. This side dish works well with beef dishes.